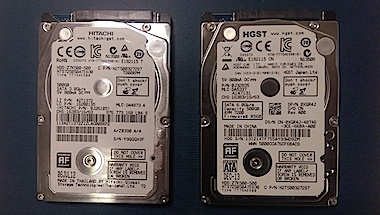 We’ve recently noticed a large number of slimline 2.5″ Hitachi and HGST hard drives that have developed problems and are being sent to us for data recovery. These Travelstar Z7K500 series hard drives can be 250GB, 320GB or 500GB capacity, spin at 7200RPM and are 7mm thick. The most common model we see is the 500GB HTS725050a7e630. Drives will begin to click and will not be recognised by the computer OR the drive still be seen by the computer but file access will not be possible. Most Z7K500 series drives are found either in external USB hard drives or inside notebook style computers. They are not found in Macs as modern Mac’s use SSD hard drives instead. Many of the Z7K500 drives we see have either a partial of full head failure. The heads are the part of the hard drive that read and write information to and from the surface of the hard drive. Recovering the data involves physically replacing the defective parts in a clean room. It is not possible to fix this problem using data recovery software, the problem is a physical one that requires spare parts. Can The Data Be Recovered? It is possible to recover the files from these broken hard drives but the work needs to be done by a good data recovery company. Unfortunately, many data recovery companies are not good, in fact they are not data recovery companies at all: they are just PC shops that say they do data recovery. They can’t. A good data recovery company like Data Clinic will have a clean room and a wealth of knowledge about individual hard drives and data recovery techniques that it’s built up over the years. A good data recovery company will be able to recover the data from a faulty Z7K500 series hard drive, a bad one won’t and worse, they may ruin the chances any subsequent company have of retrieving the data too.